The dire medical situation of shot Arizona Representative Gabrielle Giffords continues to improve. Just yesterday she was upgraded from critical to serious, and she’s acclimating herself to the environment and recovering so quickly that doctors have revised her timetable for release. According to her physicians, Gabrielle Giffords could be released from the hospital within days or weeks. Of course, she’ll be getting released into a rehabilitation facility, but that’s definitely a sign of progress! “We’re all very optimistic, so we could be wrong, but we all want to see the best and sometimes we see what we want to see. But if he says she’s smiling, I buy it,” said trauma surgeon Dr. Randall Friese, who operated on Giffords to remove bone fragments from near her eye socket. Giffords has recently been said to have given her husband a neck massage and to be showing signs of recognizing people around her. Giffords was the target of crazed assassin Jared Lee Loughner, 22, who shot 19 people at a “Congress on Your Corner” event at a Tuscon, Arizona, grocery store. 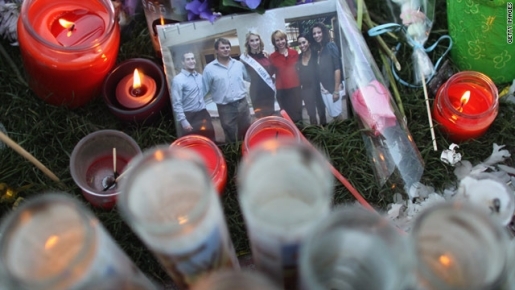 Six of the shooting victims, including a 9-year-old girl, died; two others besides Giffords remain in the hospital.